Another person killed by police. It’s becoming an all too familiar headline. Same story, different name. But not just a name; a human being. I hear people say, “They need to take responsibility for their actions. They should not have been ________ (fill in the blank),” referring to the victim. Let’s say Alton Sterling was doing something more than selling CDs in front of a convenience store. Let’s say he did threaten someone with a gun that led to a 9-1-1 call. Can we honestly say that the events that subsequently transpired were the best course of action? The consequence for Alton Sterling was death. The punishment does not fit the crime (if some crime was committed). Not to mention, if a crime was committed, he was not allowed due process by the justice system to be proven innocent or found guilty. I’m not playing the race card. It’s what has been dealt. I won’t wave the black banner for justice and civil rights. That is not where my hope lies. I wave the banner of Jesus Christ – the banner of compassion toward people who are suffering and forgiveness toward those who wrong others. Let God bring justice; and I will bring love. We see it every day on social media. Donald Trump or Mark Zuckerberg giving away loads of money if you just share a post. Don’t we all know if it’s too good to be true, it probably is? Nothing in life is free. But is the Good News too good to be true? The Gospel is that all have sinned, but if we repent of our sins & accept the free gift of salvation given by Jesus Christ, we’ll spend eternity with Him & enjoy the benefits of a relationship with Him while on this Earth. Other religions make you work for it. Muslims must observe the five pillars in hopes that their good deeds outweigh the bad. Buddhists go through a cycle of rebirth, following the Noble Eightfold Path until they reach nirvana. Hindus go through a cycle of reincarnation based on karma until their good deeds are good enough to achieve oneness with God. Christianity is the only faith where salvation is free, while the others take work. Anything worth having takes work, one may say. But what if the work has already been done for you? Jesus Christ has finished the work & given salvation to you. All you have to do is accept the gift. The good news is that the Good News is true. Some people think that Starbucks has declared a “war on Christmas” with their recent Christmas cups design. Some Christians think they are attempting to take Christ out of Christmas. Even some non-believers think that they are diminishing the Christmas spirit with this plain design. Jeffrey Fields, Starbucks vice president of Design & Content, says, “In the past, we have told stories with our holiday cups designs. This year we wanted to usher in the holidays with a purity of design that welcomes all of our stories.” On one hand, yes, that statement shows that Starbucks is taking a more universal, politically correct approach to the holidays by not focusing on one group of people, but including everyone. This is what society does. They take Christianity out of the public eye. Does it bother me in general that the world is trying to make Christianity less visible? Yes. But am I offended? Over a cup? No. It’s not the world’s job to show the world Christianity. It’s my job. And there are much more important things for me to focus my attention on. Was there an uproar such as this when prayer was taken out of schools? Besides, the cup is still red, which represents Christmas. If you know anything about trends, you know that the trend these days is minimalism. And this is just that, a very minimal design. If you want a cup that celebrates Jesus, go to Cookout. So instead of getting all worked up over a coffee cup, let’s share the love of Jesus this holiday season. Get in the streets and do something. Help the homeless, mentor a young person, give to a family in need. Better yet, share the love of Jesus all year. Pray for people, help them and tell them of Jesus’ love. Wondering what songs are going to be on the “SHAKEN” worship album? Check out the track list and stay tuned for more information right up to the October 30th release. My desire is to bring people into the presence of God where only He can change them. I’ve been leading worship since 2009 and writing music since 2011. 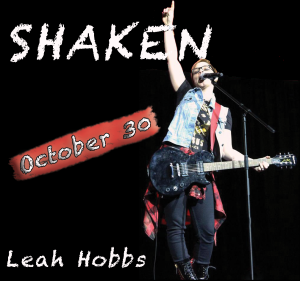 I’ll be releasing my first worship album, “Shaken,” on October 30th, 2015. This album will take the listener into the presence of God where He will move and change their lives, bringing healing, deliverance, and a personal encounter with Him. This album is a unique experience, crossing genres, to bring a fresh sound to worship. From rock to country, and worship to dubstep, this album has something for everyone. It will have you jumping on your feet and rocking it out, then bring you to your knees in intimate worship. I find inspiration from worship artists, such as, Jesus Culture Band, Kim Walker-Smith, Bethel Music Collective, Fearless Bnd (formerly Worth Dying For), and David and Nicole Binion. I also enjoy Lecrae and the other Reach Records artists, plus For Today and Sleeping Giant. Stay tuned for more information and details on how to purchase this album. Monday Night Football. Seattle vs. Detroit. With under 2 minutes to go in regulation, Seattle’s Kam Chancellor punches the ball out from Detroit’s Calvin Johnson, as he’s about to cross the goal line. Fumble. As the ball heads out the back of the end zone, Seattle’s KJ Wright intentionally taps the ball to hurry it out of bounds with the back judge staring right at the play. Touchback. Seattle ball. Allowing Seattle to protect their 3 point lead. Except, according to NFL retired referee Gerry Austin, a batted ball is illegal by rule 12, section 4, article 1, and Detroit should regain possession at the goal line. Apparently, Austin is the only one on the planet that knows this rule. No one on the field, in the booth, or in NY – including officials, coaches, players, commentators, analysts, SportsCenter, not even Steve Young or Ray Lewis – knew this rule or said anything during the play. Dean Blandino, the NFL’s VP of Officiating, stated, “Judgment call on the field. Back judge felt it wasn’t overt…” Austin, who brought the rule up in the first place which caused the controversy, later said if it wasn’t a solid call, he wouldn’t have made a game changing call either. As a Seahawks fan, we came out on the fortunate side of this no call, as head coach Pete Carroll said. But as one who likes to analyze sports, let’s ask the question how can a rule be left to one’s judgment? Why does the NFL have so many stringent rules that the majority of the NFL universe didn’t even know this one? Yes, it impacted the game in a way, but at the same time we can’t speak in absolutes that it definitely changed the outcome. The Lions still had to score and then stop the Seahawks from pulling out one of their miraculous last minute drives. And let’s face it, if the judge had thrown the flag and enforced the penalty, the conversation would be centered around a rule that makes no sense that no one has heard of and how it cost Seattle the game. If President Barack Obama and Justin Bieber call Jesus Lord, does Jesus say no? Then why do we say no? I know, I know… *insert sarcasm*… the President is really a Muslim pretending to be a Christian. I get it… his politics scream antichrist. And we all see the whirlwind of trouble and rebellion the Biebs has got himself into over the recent years. Their actions don’t equate to fruit that a Christian should be producing. But how many of us call ourselves Christians, but act otherwise? Grant it, you can tell a Christian by their fruit, but unfortunately there are too many of us who are producing fruit that is sometimes a little sour to call anyone else on the carpet. Let’s do two things here: 1) let’s ALL who call Jesus Lord strive to live a holy lifestyle reflective of our relationship with a holy God; 2) let’s allow Jesus to decide who belongs to Him, because remember He never turns anyone away. Mike Brown… Darren Wilson. Eric Garner… Daniel Pantaleo. Walter Scott… Michael Slager. We’ve all heard these names. These recent killings have sparked movements across the nation that focus on injustices that appear to happen to a specific group of people. While it may be necessary, it can also inadvertently breed an underlying current of division because of these categorizations. The person who may or may not have acted completely responsibly and innocently matters. The person who made a mistake, exercised poor judgment, or even consciously made a horribly tragic choice still matters. No matter what side of the equation, the people involved are still people, whether they were right or wrong. We must be careful to not dismiss anyone as invaluable, regardless of their actions, while we push to raise the value of someone else. To get to a better place, everyone must matter. Jesus died for all lives. To Him, all lives matter. Musical artist, fashion designer, celebrity… ego-maniac… Yeezus? So what is it about Kanye? Is he one of this generation’s gods? What makes him so appealing that the masses want to follow, even worship, him? It’s a complex idea to sort through, but my point here is really simple. What if Kanye used his influence and artistry to bring those masses to Jesus Christ? What if he took Paul’s approach – follow me, as I follow Christ? So many celebrities have huge followings and major influence. It would be worth so much more if their message was one that changed your eternity. Four freshmen led the Duke Blue Devils to win the 2015 NCAA men’s basketball national championship. Now the questions remain: who will return, and who will be “one and done” and enter the NBA draft. Attitudes toward whether young athletes with supreme talent should go pro or continue their college career/education span the spectrum. But are comments like this Senator’s tweet necessary? Everyone’s entitled to their opinion, but your opinion doesn’t make their choice wrong. More often than not, I feel there’s no hurry to go pro. Finish your free education and continue to develop as an athlete and mature as a person. Your talent will be even more refined once you reach the big leagues, and you’ll have a fall back plan should something go awry. But, on the other hand, it’s an elite group of people that even have the skills to make it in professional sports, and an even smaller percentage that have superstar success. So if that’s you, and you feel it’s the right decision for your life, then go for it.